Sanjay Leela Bhansali must be cursing the day he chose to bring Queen Padmini to life. The violence that began in Jaipur, Rajasthan has followed the man to Kolhapur, Maharashtra. The sets of his period drama have been brutally vandalised. His crew has been manhandled, not to mention the extensive financial and creative damage which has been incurred by the film fraternity as a whole. The irony is all the more pronounced because a caste-based outfit is vying to protect the projection of a woman who, in her life, didn’t need any protection whatsoever. A queen, whose strength and bravery, it is said, was as enamouring as her timeless beauty. The story of how Allaudin Khilji was immensely attracted to the lovely wife of Rana Rattan Singh has been told multiple times. From folklore, the tale has travelled throughout the length and breadth of this country to almost become a legend. That the story inspires such passion amongst Indians in general and Rajputs in particular is understandable. What is incomprehensible, however, is the way this issue has been approached. Because the Karni Sena was uncomfortable with Bhansali’s narrative, he was made to tow the line and succumb to the group’s aggression. As if the 'Censor' Board (which lately has become a second-rate filmmaker’s personal fiefdom) was not enough, Bhansali was bullied into adding another layer of scrutiny. The attackers asserted their right to go through the script, witness the shooting and thus determine whether the film is ‘appropriate’, ‘historically correct’ and ‘non-provocative’. For the lack of a punitive action against the miscreants, this compromise (later dubbed as consensus) was deemed apt. Only that, by now, this episode had injected innumerable toxins into the very fabric of India. Toxins which have gradually begun to manifest in the form of group hatred, deliberate discrimination, and sponsored acrimony. At this juncture it becomes critical to analyse this incident threadbare and bring out the undercurrents which have steadily pushed our society towards the edge. To begin with, while the legend of Queen Padmini (referred interchangeably to as Padmavati in various texts) is well established, its factual accuracy is not. 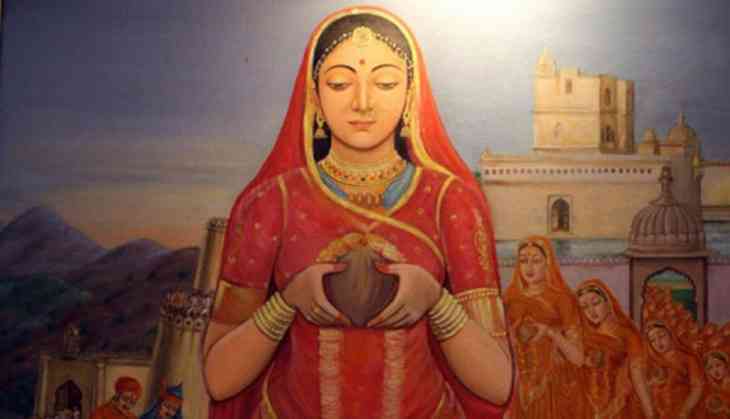 The first time her tale unfolds, is in Malik Muhammad Jayasi’s epic Padmavat, written in 1540 AD. She is portrayed as a Sinhala princess (think Jacqueline Fernandez) who was married to the King of Chittorgarh. By Jayasi’s own admission, his poem was ‘a work of fiction’. Even if this is overlooked, we come across numerous other sources, preceding Padmavat, which detail Allaudin Khilji’s Chittor triumph without as much as mentioning the famous queen in passing. It is true that history does not glorify the vanquished, but neither does it obliterate them altogether! If she really did exist, why would historians be silent about it? If she did not, why should we be so fanatical about it? This is almost like saying that centuries from now when those tall, marble statues of a woman with her characteristic handbags and sandals are discovered in Lucknow, she would be construed to be a Goddess. Quite obviously, anyone who questions her Godly status will be beaten up for being pseudo-secular and anti-national. Delving deeper into the topic, it isn’t too difficult to see that a specific pattern of caste assertion is at play here. Rajputs, occupy the second place in the Hindu caste hierarchy. Largely known for their fighting abilities, the clan traces its origins to the warrior tribes of yore. That they were fond of extravagance and luxury is clearly visible in the monuments, artefacts, sculptures and palaces they have left behind. Unfortunately, either owing to internal dissensions or due to self-belief bordering on arrogance - Rajputs were defeated quite often. Be it Prithviraj Chauhan’s loss to Mohammad Ghori or Rana Sanga’s downfall at the hands of Babur, history has not been very kind to them. From the Sultans and the Mughals to the Marathas and the British, the Rajput memoirs are filled with lost causes. They’ve won battles, but performed miserably in wars. This, prima facie, has led to the birth of legends, in whose extraordinary courage and gallantry, lies the salvation of a wounded pride. Anyone who lays a finger on the singular narrative they propound would most certainly be assaulted. In a world where surnames hold more value than actions, such instances would continue to surface. An extension of the same argument has also started to spread its tentacles across the country. What is considered to be a caste lens on a micro level can as easily become a nationalistic prism on a macro level. The right wing, after a long sojourn in ideological dark woods, suddenly finds itself in command. It realises that the only way to harmonise its flawed philosophy with modern developmental goals, is by placing itself firmly on one end of the political spectrum. What better way to do this than by exploiting religion! Demonise the minority, create a wedge between ancient (read Hindu) and medieval (read Muslim) history, brew a potion of divisiveness and in the process, legitimise the need for using violence as a weapon for extracting immediate vengeance. Precisely why Bajirao bedding Mastani is okay but Khilji flirting with Padmini is not. These ideas - when coupled with an atmosphere where dissent is shouted down, liberty is frowned upon and mockery is made a tool to further derision - end up empowering the so called ‘fringe’ groups, granting them the license to run amok and silence people with their newly acquired hostility. Last but certainly not the least, the notions thus propagated, also gel wonderfully well with the broad structure of patriarchy. Padmini was valiant not because Jayasi calls her a master of all arts, including swords craft. Padmini was valiant because she decided to kill herself instead of being ‘defiled’. Clearly, a woman’s honour resides in her genitalia. The only thing she can be famous for is her beauty. For everything else, there has always been a coterie of men, vowing their lives to ‘guard’ her. It’s strange how most of our stories revolve around themes where dignity is linked to how our women behave. Paternalism, anyone? Bhansali might still end up creating a beautiful piece of art. The Padmini he depicts may be a demure maiden. His portrayal of Khilji may not even dare to dream about his object of fantasy. The poised queen may gracefully embrace Jauhar (unlike Kangana Ranaut). Yet, what his work would represent is not a story of the times gone by. What it would really show is a modern-day tale of suppression, repression and oppression. After all, everything is fair for war and honour. Oh, the travails of being Padmini!